I was talking on the phone with my grandmother a few months ago, and she told me about October beans. She said that she grew them every year. I knew I had to try them. They were a little tricky to track down, but I eventually found some online to order. I think they have to be one of the prettiest beans I have ever seen. I hope that they grow well so we can try them in the fall. Maybe I will even be able to take some to my grandmother. Readers, have you ever tried October Beans? I've seen them before, but never knew the name. I have tried a number of dried heirloom beans. Lots to try at Decorah Seed Savers.Vermont Seed was another source as well as Johnny's. Good Morning, Lisa. I've never heard of October beans but they are so pretty. I just googled and learned they are a Native American bean from the 1830's. Wishing you much success! They are pretty. Are they kind of like pinto beans? They sure are and now I want some too! those are lovely - i have never heard of them before. i cant wait to see how they grow. My first reaction was how pretty they are. In a way, they look like songbird eggs. No, I have never heard of them. I will have to Google and see if they are like limas or green beans. October will be exciting! They look a lot like dragon tongue beans actually. Are they a bush or pole bean? I've never heard of them before...will be anxious to see how your's grow. I have not heard of these. I hope they do well for you. They ARE pretty-like beads! Good luck growing them. Those are very pretty beans! 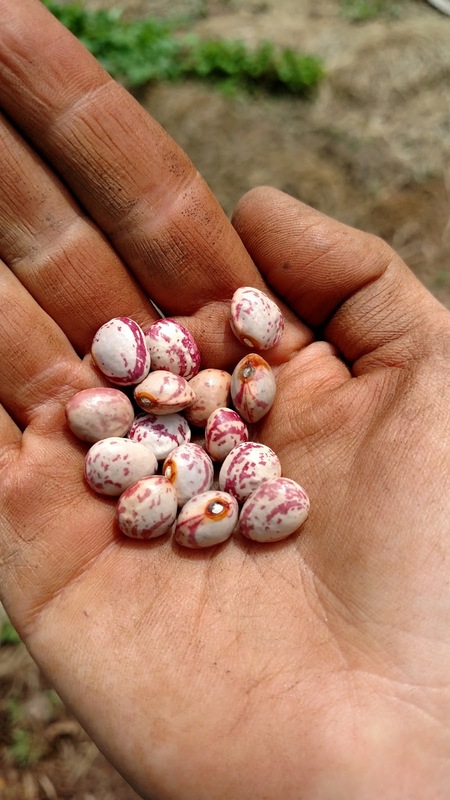 They look similar to the Berlotti beans we have here in France. They are pole beans and very tasty. They are pretty! I've never heard of them before! So pretty and interesting... I can't wait to see what October brings! That will be fun if you get to take them to your grandma! :) Congrats on finding them. Neat! Isn't it great that you found them! I haven't. I hope they grow well for you! I've not heard of October beans, but these look very similar to Anasazi beans that we get from Colorado.